Beginner Piano Songs - Found a Peanut, FREE! Beginner piano songs for young kids are even better when the tune is familiar, and the words are fun or even silly! "Found a Peanut" is just that kind of song! Please scroll down the page for the PDF links to Found a Peanut. When I teach this song, I usually start with the student on the CHORDS, not the melody, some weeks before actually showing them the music. I play and sing the melody, and show them how to make the chords in the right places. Just because the notes are set in the Middle C position doesn't mean this song will be easy at first. There are too many skips. As they work on the melody, you might try having them proceed VERY SLOWLY, as if a land mine awaits "missteps." Even if you have prepared their ears for the melody by working with the chords first, they likely will not "hear" the melody, playing so slowly. That's fine. Tell them it's the job of their EYES, not their ears, to find the notes right now. You may find - believe it or not - that the song becomes TEDIOUS to you after a few verses. However, there is a certain age group among your students which will find these lyrics HILARIOUS. These kids will want to do the entire song NOW. For a change of pace, just switch places and let your student play the chords while you play the melody. They can start with easy triads, one chord every two measures (since it is a VERY FAST 3-beat song, written so beginners won't be intimidated by eighth notes). If your student is older, ask them what the chords would be if you moved the melody up to the key of D? See if they can figure it out BY EAR - then discuss the theory behind the chords - how the I and V chords (One and Five chords) "love" to go together, and that when the melody has a different key "home", the chords change along with it. Try the key of G also. Unless you have had them doing pentascales for a little bit, the I and V chords in the keys of E & F might be frustrating. Keep the Found a Peanut lyrics moving ahead as you move the key center! If you find yourself fumbling with the melody as it transposes, just sing. Your voice will be plenty loud to go along with your student's chords. Then, make the chords MORE FUN. Quiz your students about the melody notes: what's the difference in the slurs versus the ties? Can they figure it out by just looking, and singing? Again, when I teach this song, I usually start with the student on the CHORDS, not the melody, some weeks before actually showing them the music. 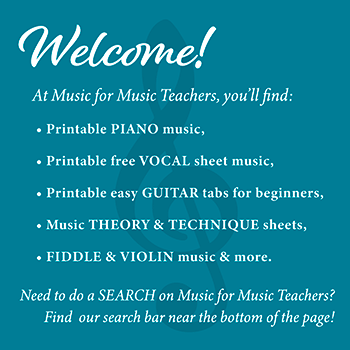 There is plenty to learn here, for the beginner piano student!